Back in March I was hard pressed to find something to motivate my students to read. They were losing stamina quickly and I needed to do something to raise their spirits. So upon the suggestion of some other teachers on Twitter, we did a March Book Madness where they voted for books and battled it out for their favorite to be champion. "I'm so going to vote for him. I want to see him pour something over his head." "That's not fair. He's bribing us. No one would vote for Smekday if it weren't for his offer." "That's totally fair. People voted for books they never read in previous rounds just because people told them to. He's actually giving us something in return for voting for his book." 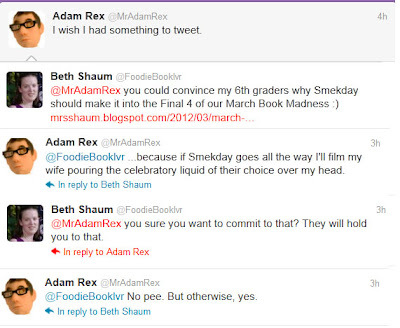 "Smekday would've never won over The Hunger Games if Adam Rex hadn't gotten involved." But I look at it this way: if we're getting passionate and invested in conversations about BOOKS, then I guess we were able to get out of our reading rut after all and that's definitely a good thing. 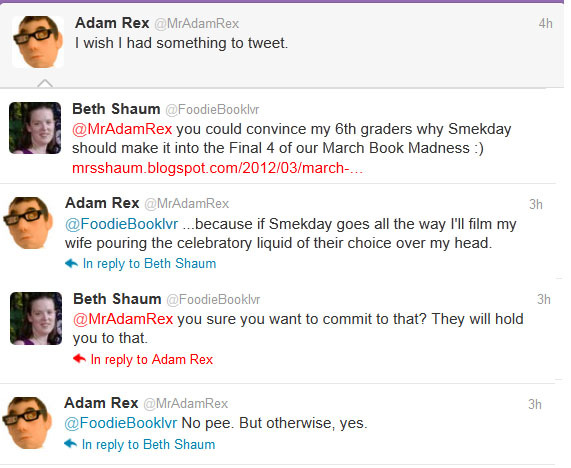 Not to mention that yes, had Adam Rex not intervened, I'm sure The Hunger Games would have won. But just about everyone has already read The Hunger Games. What a win for The True Meaning of Smekday did was get kids who would have otherwise turned their nose up at it to actually read it now. Plus, some of the kids who have already read Smekday are feeling more compelled to read Rex's current novel Cold Cereal (which I am listening to the audiobook of right now). So I think it was win-win. My kids got to watch an author make a fool of himself for them, and the author got more kids to read his book. So at what point do you let him know that he didn't actually hold up to his end of the deal, and that you're still waiting his promise? this was awesome. i totally would have voted for smekday, too, if i had been one of the kids.